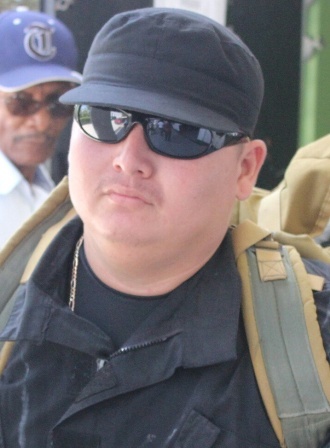 This morning, twenty-nine year old Special Constable Juan Moralez was all smiles when a charge of Wounding was withdrawn from him since his wife, the alleged victim, requested no further court action. Moralez’s wife, Betzabe, took the stand before Magistrate Ladonna John saying that on the day she made the report she was angry because of some messages she saw on his cell phone. She was not required to go into further details and the Magistrate withdrew the charge of Wounding against Moralez and he was free to go. Betzabe had initially claimed that on different occasions, there were domestic disputes between them and that she feared for her life. On the last violent occasion, he had put her out of their Chetumal Street house and according to Betzabe, when she went to get her clothes accompanied by two police officers; he told her she isn’t going anywhere. The situation turned ugly and according to Betzabe her husband walked threateningly toward her and that she saw a knife in his hand which cut her on her lower left arm. She screamed for help and the police removed the knife from her husband. But with all these details, she did not wish to proceed with court action so the cop was freed of the charge.